As we begin to close out 2018, and 2019 fast approaches, I’d like to take this opportunity to reflect on Petroteq’s progress in 2018 and provide insight into our near-term strategy and goals for the Company. Developed specifically for our patented, environmentally friendly clean oil recovery technology and production process, our Vernal, Utah facility was successfully relocated, reconstructed and restarted earlier this year. The move, executed within only 8 months, allowed us to expand the facility’s capacity, currently designed to produce at a rate of 1,000 barrels per day (bpd). We believe that the recent volatility of global commodity prices has been a cause for concern to conventional oil producers subject to high production costs. However, Petroteq’s state of the art technology and process, with production costs of only approximately US$30/barrel, significantly mitigates those concerns and supports healthy margins despite prevailing market conditions. Furthermore, upon receipt of the necessary capital, the Company intends to expand the Vernal facility beyond the current capacity of 1,000 bpd. We firmly believe that Petroteq is squarely on the right path to accessing and producing from the majority of Asphalt Ridge’s 87.495 million barrels of contingent resource, details of which are available in a report titled “Evaluation of Contingent Resources” from Chapman Petroleum Engineering, Ltd. dated May 31, 2018 (the “Chapman Report”). Such contingencies are stated below. Petroteq’s board recently brought the matter of a 1 for 10 consolidation of the Company’s common shares to a shareholder vote, a necessary corporate action for Petroteq in order to reach a minimum share price requirement for listing on the NASDAQ Capital Market. Shareholders overwhelmingly approved the measure, however, the board has resolved that the Company will not use a consolidation ratio beyond 1 for 5. The Company intends to engage a transparent and cautious methodology to the proposed NASDAQ listing with the belief that, given the recently achieved and the anticipated milestones, it may meet the requirements for a NASDAQ listing without corporate intervention. Acceptance for listing Company shares is subject to approval, in part, based on the Company's ability to meet minimum listing requirements for the NASDAQ Capital Market. While Petroteq intends to satisfy all of the applicable listing criteria, no assurance can be given that its application will be approved. The Company continues to work towards a goal of running multiple operational facilities, with larger production capacities and expanded licensing opportunities for its technology, including the potential deployment of this technology for soil remediation and reclamation of environmental hydrocarbons. We will approach these other potential value-add projects through licensing, joint ventures and other such structures, always being focused on minimizing capital expenditures and maximizing the creation of shareholder value. In 2019, we will move the Vernal facility into Phase 2 of its lifecycle, during which we plan to increase production capacity from 1,000 bpd to 4,000 bpd by the end of the year. Civil construction of the additional process train will commence in the second quarter of the year, with the expansion estimated to come online by the third quarter. We will demonstrate an increased focus on production in the third quarter as the process trains ramp up to 4,000 bpd through tandem operations. As we execute on our strategy and share our vision for the future, we remain committed to achieving each of the Company’s deliverables and will keep our shareholders informed throughout. Our plan is designed to ensure we constantly strive to become a more focused and efficient company. As the Company grows, we will focus our asset base to achieve consistent, incremental production and will follow a disciplined capital allocation process with the intention of reducing our costs. We believe this approach will enhance our Company’s sustainability and returns for its shareholders. At this critical juncture in Petroteq’s corporate development, I look forward to working alongside our board of directors, management and on-site operational teams as we execute our plan and strategy. We will continue to communicate with our shareholders regularly and look forward to sharing new developments soon. On behalf of everyone at Petroteq Energy, I would like to wish you all a safe and happy holiday and a prosperous and safe 2019. Certain statements contained in this press release contain forward-looking statements within the meaning of the U.S. and Canadian securities laws. Words such as “may,” “would,” “could,” “should,” “potential,” “will,” “seek,” “intend,” “plan,” “anticipate,” “believe,” “estimate,” “expect” and similar expressions as they relate to the Company, including: including the production capacity of the plant and when it may be achieved; completion of the consolidation; listing on Nasdaq; the Company having multiple facilities, larger production capacities, and licensing opportunities for its technology, including potentially using its technology for soil remediation and reclamation of environmental hydrocarbons; the structures used in any successful licensing opportunities; licensing opportunities creating shareholder value; the Company becoming a more efficient company with a stronger balance sheet; the Company achieving consistent production; the Company reducing costs; and the Company successfully developing blockchain technology for the oil and gas industry and the anticipated benefits of such technology, are intended to identify forward-looking information. Readers are cautioned that there is no certainty that it will be commercially viable to produce any portion of the resources. All statements other than statements of historical fact may be forward-looking information. Such statements reflect the Company’s current views and intentions with respect to future events, based on information available to the Company, and are subject to certain risks, uncertainties and assumptions. Material factors or assumptions were applied in providing forward-looking information, including: the contingencies in the Chapman Report being overcome; regulatory/stock exchange approval of the consolidation; the Company meeting all of the listing requirements of Nasdaq; Nasdaq approving the listing of the common shares, and PetroBLOQ successfully developing and implementing a blockchain-based supply chain management system. While forward-looking statements are based on data, assumptions and analyses that the Company believes are reasonable under the circumstances, whether actual results, performance or developments will meet the Company’s expectations and predictions depends on a number of risks and uncertainties that could cause the actual results, performance and financial condition of the Company to differ materially from its expectations. 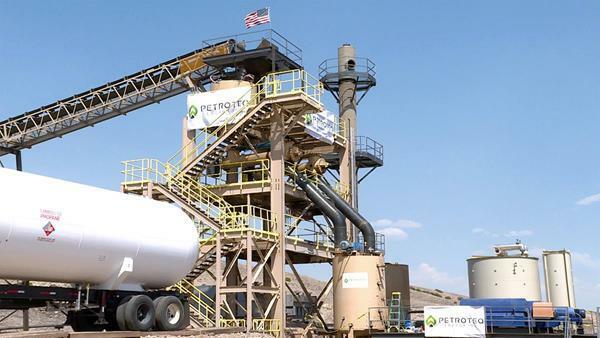 Petroteq’s proprietary solvent based extraction technology is unproven to produce on a commercial basis at 1,000/bpd. Commercial production of 1,000/bpd at its existing plant is unproven and expansion at the existing plant or a new larger plant is subject to financing, development and testing to prove it is achievable and commercial. Certain of the “risk factors” that could cause actual results to differ materially from the Company’s forward-looking statements in this press release include, without limitation: uncertainties inherent in the estimation of resources including whether any reserves will ever be attributed to the Company’s properties; since the Company’s extraction technology is proprietary, not widely used in the industry, and has not been used in consistent commercial production, the Company’s bitumen resources are classified as a contingent resource, because they are not currently considered to be commercially recoverable; full scale commercial production may engender public opposition; the Company cannot be certain that the bitumen resources will be economically producible and thus cannot be classified as proved or probable reserves in accordance with applicable securities laws; PetroBLOQ not having the expertise and/or funds necessary to develop and implement a blockchain-based supply chain management system; PetroBLOQ not being able to develop the blockchain technology to completion; blockchain technology not being adopted by the oil and gas industry; changes in laws or regulations; the ability to implement business strategies or to pursue business opportunities, whether for economic or other reasons; status of the world oil markets, oil prices and price volatility; oil pricing; state of capital markets and ability by the Company to raise capital; litigation; the commercial and economic viability of the Company’s oil sands hydrocarbon extraction technology, and other proprietary technologies developed or licensed by the Company or its subsidiaries, which are of experimental nature and have not been used at full capacity for an extended period of time; reliance on suppliers, contractors, consultants and key personnel; the ability of the Company to maintain its mineral lease holdings; potential failure of the Company’s business plans or model; the nature of oil and gas production and oil sands mining, extraction and production; uncertainties in exploration and drilling for oil, gas and other hydrocarbon-bearing substances; unanticipated costs and expenses, availability of financing and other capital; potential damage to or destruction of property, loss of life and environmental damage; risks associated with compliance with environmental protection laws and regulations; uninsurable or uninsured risks; potential conflicts of interest of officers and directors; and other general economic, market and business conditions and factors, including the risk factors discussed or referred to in the Company’s disclosure documents, filed with the securities regulatory authorities in certain provinces of Canada and available at www.sedar.com. Pursuant to the Chapman Report, the following is a summary of contingencies and project risk related to the Company’s 93.4 million barrels of contingent resource, listed in order of importance: (i) Verification of actual full scale processing and operating costs. Although the Company has developed detailed estimates of these costs by operating the pilot plant, they will need to implement the full scale project in order to know these costs with certainty. Chapman has estimated a 90% probability that operating costs will be in the ranges estimated in the monte carlo simulation, as documented in our September 1, 2016 report. The simulation indicates that there is a 97.5% likelihood of having an economic project if costs are in those ranges. Therefore, the probability of this contingency being overcome (i.e. operating costs are in the range estimated by Chapman) is estimated at 88%; (ii) Mining costs will be similar on all Company lands. Detailed mining cost estimates have only been prepared for the first 12.8 MMSTB of bitumen to be mined, but it is anticipated that the bitumen volumes could be scaled up at a similar cost. The probability of this contingency being overcome (i.e. all actual mining costs being in line with initial estimates) is estimated at 95%; and (iii) Regulatory permission will be granted for all future stages. This is seen as very likely, and there are no major regulatory hurdles remaining to overcome. However, there is potential for public opposition to a project of this nature. The probability of this contingency being overcome (i.e. all future regulatory approvals being granted) is estimated at 98%. Chapman has estimated that it is 81.9% likely that all of the above contingencies will be overcome.